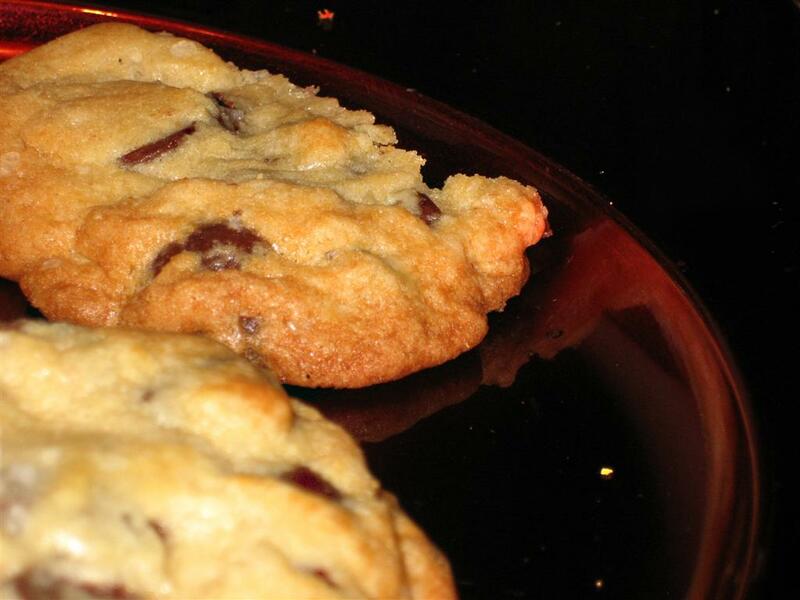 Never Use Another Chocolate Chip Cookie Recipe Ever Again! There’s not an awful lot to say about this recipe other than MAKE IT. I don’t care if you don’t have the specific ingredients; go get them! 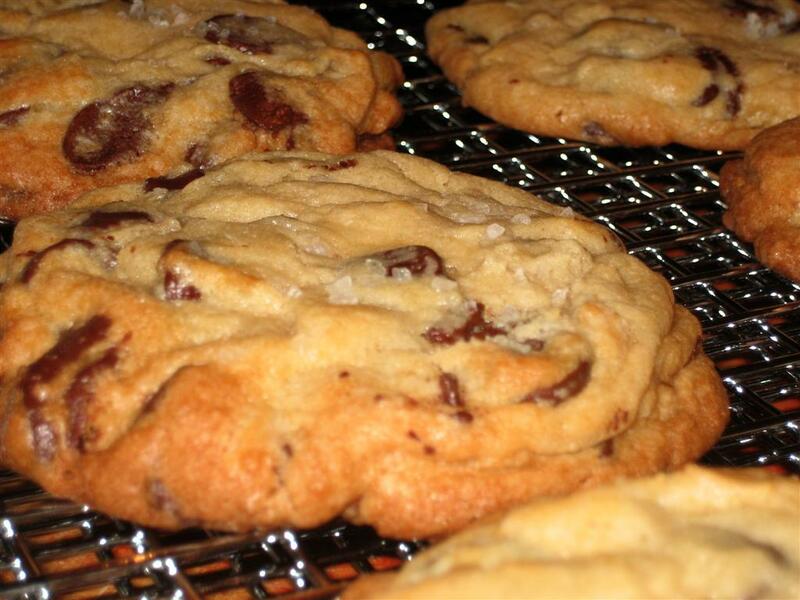 These cookies were genetically engineered to be the best ever. EAT US...WORSHIP US...GIVE IN TO US...BRING A GLASS OF MILK! My only issue is, I wonder why mine were so much thicker than the ones on Smitten Kitchen? Maybe my balls of cookie dough were bigger…or maybe the dough was too cold (fresh from the refrigerator) and couldn’t spread out enough before it baked? When I make more tomorrow I’ll try letting the dough thaw out a little first. Though there were no complaints – Z pointed out that they had two layers of chocolate chips, and that’s never a bad thing! He also declared them “the best chocolate chip cookies ever!” and he’s eaten a lot of chocolate chip cookies. Sift into a bowl the flours, baking powder and soda and salt; set aside. In a Kitchenaid or similar mixer fitted with a paddle attachment, beat the butter and sugars until light and fluffy (about 5 minutes). Add the eggs one at a time, beating them in well. Add the vanilla and reduce the speed to low and add the dry ingredients, mixing until just combined. Carefully mix in the chocolate discs, making sure not to break them. Press some plastic wrap against the dough and refrigerate for at least 24 hours. When you want to bake them, preheat your oven to 350 and drop six slightly-larger-than-golfball-sized balls of dough onto a lined cookie sheet and sprinkle with extra salt. Bake for 15-20 minutes…the outside edges should be crispy and brown and the middles cooked through, but still very gooey. Eat warm with milk…or your choice of milk substitute. Ok, very small Anna, I’m going to give these a whirl EVENTHOUGH I can not eat them. Aunt Marie made the dough and brought it with her to BarHarbor….everyone loved them…Aunt Marie, Uncle Bruce, Ed and Bill….si, I thought I would make them for everyone here at the campground as a farewell….I’ll let you know how I do!!! I am so proud of you!!! And am in awe of your abilities! I’m excited for your like now and the one ahead! Also, as a side note I would like some paintings…just not sure which ones…..Love you! ok…I’m excited about your LIFE…and your future! Hi, my name is Val Walker and my husband and I met Bill and Sharon at the Food and Wine Festival at WDW. I have lost her address and would love to know how I can get in touch with her. If this is the same Sharon Baridon on your reply ( I am hoping it is!) could you verify it with her and have her send me a note? My new address is 4006 Knob Creek Lane, Cedar Park, TX 78613. Thanks so much. BTW, I am going to try your chocolate chip recipe! !Yum!